It’s not unusual for Michele “Mickey” Ross to hop in her car, Canon XSi riding shotgun, and go for a drive. That’s how she found a small, dilapidated dwelling and gas pump one snowy day in Sylvania. 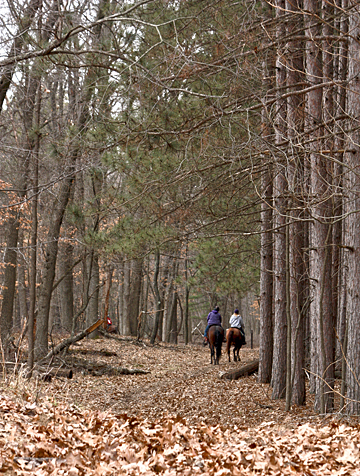 And on a fall jaunt through Oak Openings Preserve Metropark in Whitehouse, she spotted horseback riders on a leaf-covered trail. Michele “Mickey” Ross displayed some of her photography that she will have in frames, on coasters and notecards, and as prints at Art on the Mall Sunday, July 31. Armed with her camera, Ross captures places many area residents are familiar with and frames them in a new way. 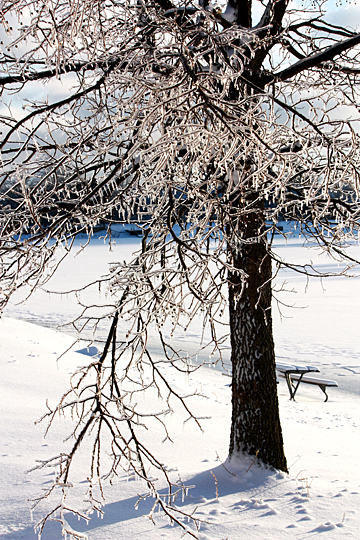 Michele “Mickey” Ross took this photo titled “Ice Tree” at Olander Park in Sylvania. Her favorite locales to wander and shoot include area parks, gardens and the Toledo Zoo. At the zoo, she caught a cormorant careening its neck to preen with an orange autumnal sky reflected in the water, as well as a regal eagle perched by evergreen sprigs. After an ice storm, she ventured carefully to Olander Park in Sylvania and clicked in the cold; the result was a stunning image of a tree encased in a shimmering frozen glaze. “It’s almost cathartic. I get lost when I go out and photograph. I can be out for hours and not even know it because there’s so much to look at and so much to see,” Ross said. She’s had an artful eye for years. So four years ago, she joined the Toledo Camera Club and the Photo Arts Club of Toledo. That’s when she got serious about her passion. 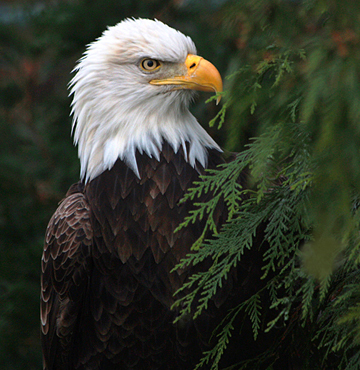 “Bald Eagle” was photographed by Michele “Mickey” Ross at the Toledo Zoo. And she’s had the chance to work with some surreal subjects, including a fairy statue submerged in an aquarium filled with a carbonated drink — a sprite in Sprite. 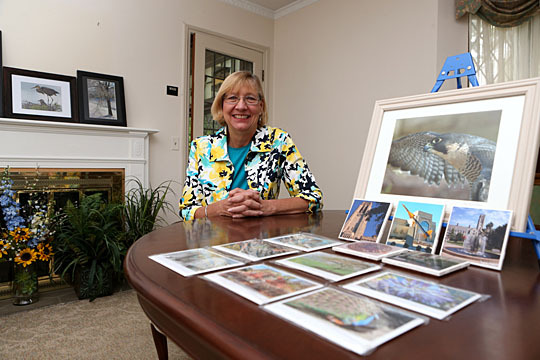 In 2013, the UT graduate who received a bachelor’s degree in 1976 returned to her alma mater and made her debut at Art on the Mall. Last year, Ross introduced a new item to showcase her photography: coasters. “A Day at the Park” was taken by Michele “Mickey” Ross at Oak Openings Preserve Metropark in Whitehouse. Pretty and practical, but finding a process to produce the coasters took some time. No surprise, her coasters featuring UT photos proved popular her second year at Art on the Mall and sold quickly. Ross does take requests. Folks who stop by her booth have asked for shots of Toledo landmarks, including Tony Packo’s, the Rosary Cathedral, and Fifth Third Field and all things Mud Hens, as well as lighthouses, trains and various animals. Ross will be at Art on the Mall Sunday, July 31, from 10 a.m. to 5 p.m. The free juried art show will be held on Centennial Mall. “I know they try to have alumni or people affiliated with UT at the event, and I think that adds to the flavor of it,” she said. In her office, Ross has a few photos that she has taken, as well as several shots that she is in alongside celebrities who appeared in Centennial Hall/Savage Arena, where she worked for 25 years. This entry was posted on Wednesday, July 20th, 2016 at 3:47 am and is filed under Alumni, Arts, Events, Features, UToday .